Mumbai: Riding on its brilliant storyline, the direction by Meghna Gulzar and performances by Alia Bhatt and the est of the cast, 'Raazi' has now joined the RS 100 cr club.The film has earned Rs 102.50 cr in 17 days.Trade sources said that 'Raazi' has becomes the first woman-centric non-franchise film to join the 100-crore club. 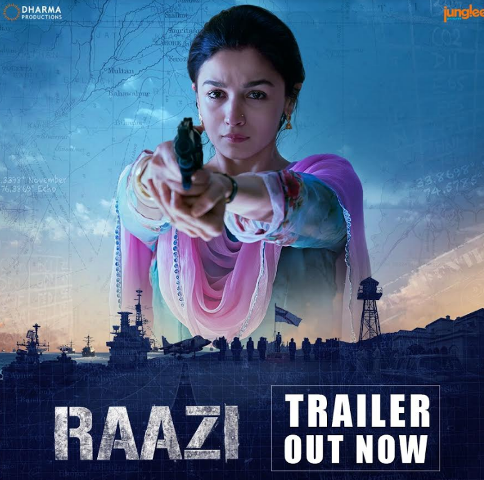 Released on May 11, 'Raazi' is a spy thriller directed by Meghna Gulzar and produced by Vineet Jain, Karan Johar, Hiroo Yash Johar and Apoorva Mehta under the banner of Dharma Productions. 'Raazi' features Alia Bhatt and Vicky Kaushal in lead roles.The film is an adaptation of Harinder Sikka's novel 'Calling Sehmat' which is inspired by real events. 'Raazi' is about an Indian spy married to a Pakistani military officer (played by Vicky Kaushal) during the Indo-Pakistan War of 1971 on the order of her father played by Rajit Kapur.